I came across an amazing image when I was preparing an earlier post, Without A Trace. Even then, I knew I wouldn’t be able to let it rest with a 20 word caption. It was of a Mosquito – a truly great aircraft that is familiar fare for airscape. But much as I’ve studied the DH98 – the ‘Wooden Wonder’; the ‘Timber Terror’ – I’d always understood that it was something of a challenge for its pilots, as well its enemies. It bore two extremely powerful engines without the comfort of counter-rotating propellers. Alone, either one could produce enough asymmetric thrust to pull the plane round in ever-diminishing circles. . . Losing one on take-off was highly dangerous; attempting to go-around from a single engine landing was suicide. Plus, like any high performance aircraft, the Mossie was built with fine lines and close tolerances – mostly carved out of balsa wood and glued together with milk proteins. 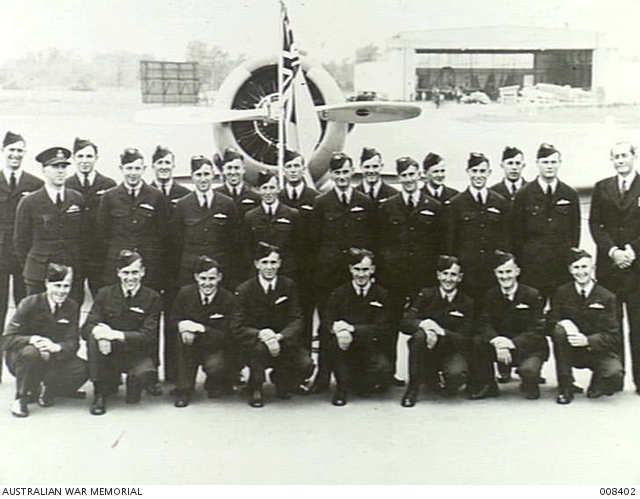 The outstanding balance of MM401, 464 Squadron RAAF, on the morning of February 21st, 1944. This photo was taken on February 21st, 1944. It shows what’s left of Mosquito FB Mk. VI fighter-bomber MM401, marked ‘SB-J’, of 464 Squadron, Royal Australian Air Force. The previous night, SB-J had departed 464’s base at Hunsdon, north of London, to strike V1 launch sites in the Pas de Calais area of Northern France. She was flown by a crew from Melbourne – Squadron Leader Arthur Geoffrey Oxlade of Box Hill and his navigator Flight Lieutenant Donald McKenzie Shanks of Toorak. They were aged 24 and 35 respectively. During their attack, the aircraft was hit by a brace of German anti-aircraft artillery and one shell blew most of the starboard outer wing to pieces. Once you’re done staring open-mouthed at the starboard wing, shift your attention to the obscured left side. You’ll notice the port propeller blades and spinner are gone, and that the aircraft is resting on the caterpillar track used to move it off the runway. 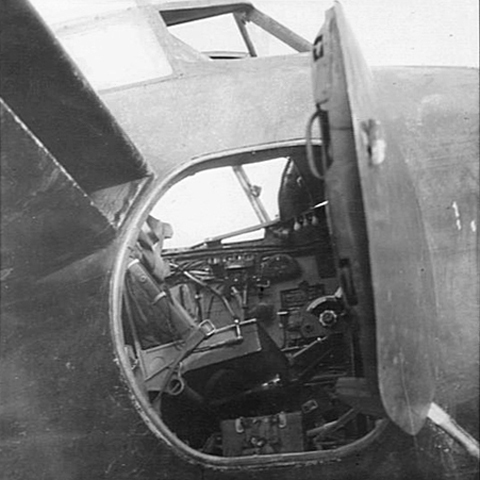 A second flak shell had shattered the port engine and destroyed the left landing gear in the rear of the nacelle. Perhaps the simultaneous and opposing losses of lift and power helped to hold the Mosquito on an even keel – but somehow, Oxlade managed to recover his aircraft and nurse it back across a frigid English Channel to Friston. He then set the plane down on the grass gently enough to walk away. 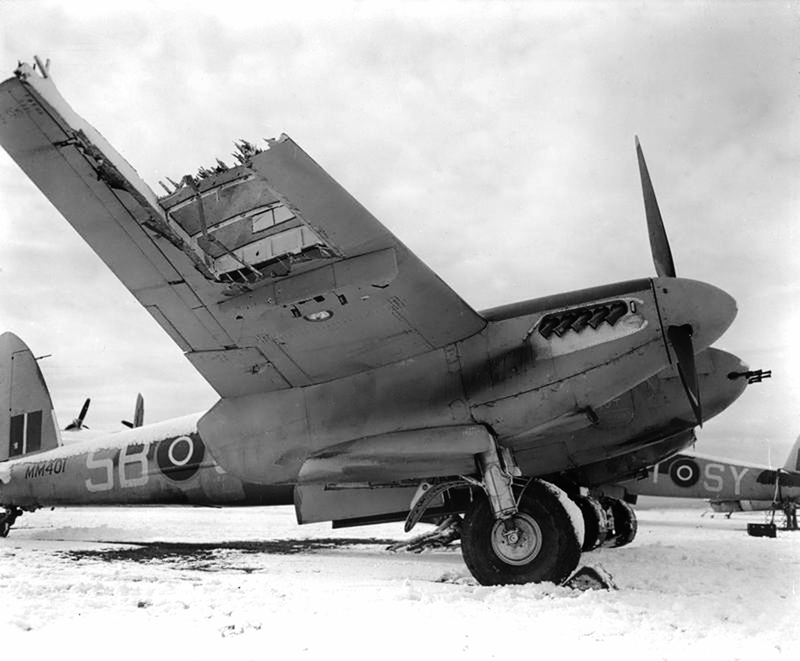 For a while, the Mosquito was even set to be repaired and returned to service. It was only after a more detailed damage assessment that it was written off! 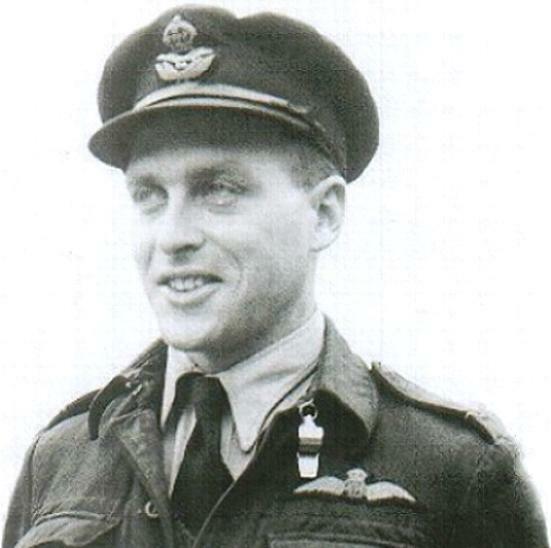 Oxlade and Shanks continued flying together, attacking the Nazi war machine in France ahead of the D-Day landings. Their part in that ‘Longest Day’ would prove fatal. They left Hunsdon at 2250 on June 5th, 1944, flying Mosquito FB Mk.VI NS897 for an armed reconnaissance of roads to the south of the invasion front. Their aircraft was coned by searchlights en route to their patrol area and hit by already-alarmed German gunners. The Mosquito caught fire around the bomb bay, but the pair pressed on and the flames went out. They then completed a two-hour patrol, only to have one engine cut out on their way back to the Channel coast, no doubt due to damage from the earlier flak..
Oxlade promptly feathered the propeller, only to have his remaining engine burst into flames almost immediately. Already down to 1,500 feet, Oxlade told Shanks to “get out if you can” and the navigator jumped. However Oxlade was unable to escape his stricken Mosquito before it crashed near the hamlet of Gueures, 13km southeast of Dieppe, between 0100 and 0200 on June 6th, 1944. 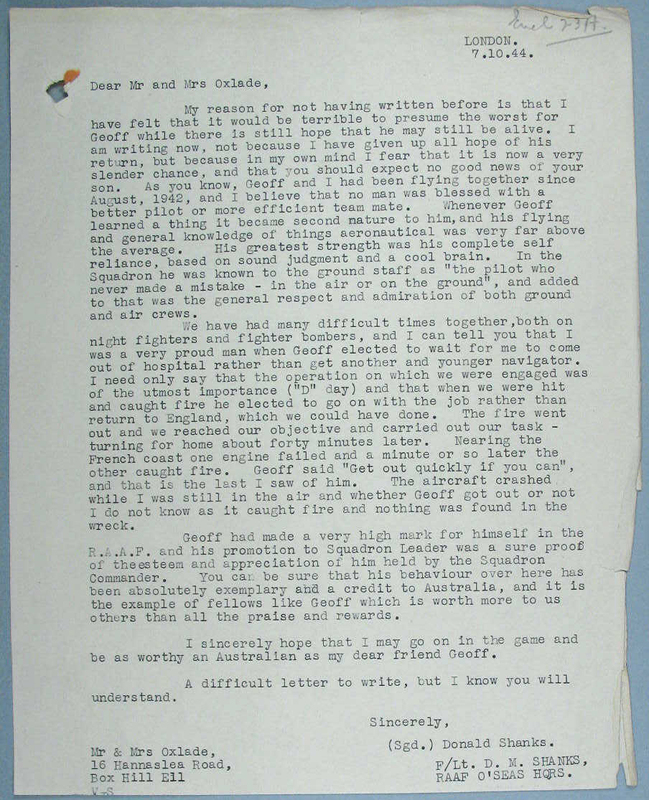 Shanks, meanwhile, parachuted into a tree, extricated himself, and managed to evade capture with help from the French. He didn’t get back to 464 Squadron at Hunsdon until the first week of September. He would earn a second Caterpillar Club membership on January 18th, 1945, while attacking targets in the Ardennes. His Mosquito that night, MM403 ‘SB-V’, lost power some 16km northeast of Merville and Shanks bailed out successfully from just 600 feet. Once again, his pilot, Flight Lieutenant Richard Murray Trites, RCAF, went down with the plane and was killed. In all, Donald Shanks survived several Mosquito crashes and the war. He returned home to Australia and passed away in 1983. He was one lucky man. For pilots, being prepared for an emergency is (or should be!) a big part of every flight. From planning ahead for an engine failure on take-off to understanding the aircraft’s systems and how they could fail, apprehension is embedded from our ab initio training. 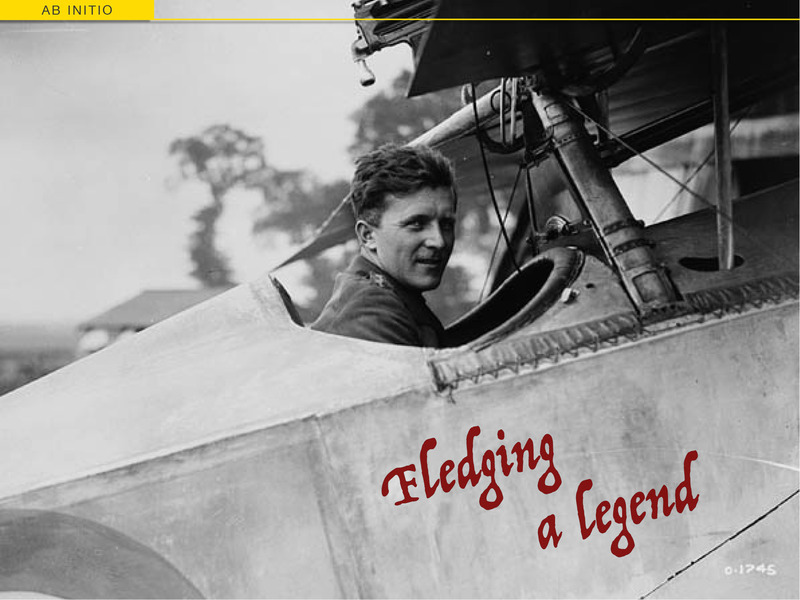 An example in skill and courage… RAAF Squadron Leader ‘Geoff’ Oxlade. All that must change when people on the ground are intent on causing harm by lobbing high explosives and hot metal at your plane, with extreme prejudice. Planning for that kind of danger, then flying into it day after day, shows a level of professionalism and courage that I can hardly comprehend. To lose a wing, an engine and a gear leg, then handle it and bring the flight to a safe conclusion, must be the pinnacle of piloting skill. If you’re ‘Mosquito mad’, you might also like Mosquito Bites, Close Call, Secrets of the Sea Mosquito and Tail Chase. And, as always, if you want to see a Mosquito grace UK skies once more, please give your love to The People’s Mosquito. For a plane which had such a reputation for being unforgiving on a single engine to have survived losing the engine, prop, wing, aileron, landing gear and probably other systems is pretty dramatic. They built ’em tough back then! I recall a photo of a B-17 with the tail nearly severed by a midair collision with a German fighter. There are countless other examples, some of ’em more recent. I think there’s one of an F-15 with basically the ENTIRE wing missing after a Gulf War mission. The F-111 which had the bird strike directly on the radome. Etc. It prompts the question: will the F-22, F-35, and other complicated, high-tech birds fare as well? I wonder which is more impressive: the built-Ford-tough nature of the airframe or the skill of the guys who flew them? It does prompt the question – about the newer fighter types, and new composite structures in general. Mind you, I have seen wood described as “nature’s carbon fibre”, so perhaps it’s not an issue. And you’re right, there are many other examples. I’m sure there was an Israeli F-16 that lost most of one wing, along with all those blown-to-bits B-17s. I wrote an article about the B-17 that had its tail all but sliced off (#41-24412 “All American”) in airscape 3, if you still have it on your iPad. There were a lot of nonsensical versions of the story circulating online; the truth turned out to be more than amazing on its own. Tough planes, and tough young men.